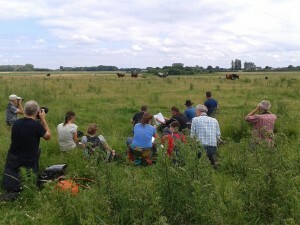 Last week, a five day long “Natural Grazing” course took place in the Netherlands. 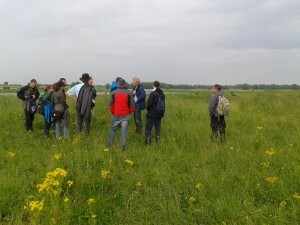 Rewilding Europe and ARK Nature organized the course to support Rewilding Europe’s local teams and European Rewilding Network (ERN) members involved in natural grazing. Participants from six European countries attended various workshops, expert discussions sessions and study tours together gaining better knowledge and insight about the topic of natural grazing. Bull of second generation crossbreeds at the Tauros breeding site run by The Taurus Foundation, Keent Nature Reserve, The Netherlands. Natural grazing was for centuries a key process in shaping European landscapes. Historical aggregation levels of herbivores are currently missing due to land use changes and exploitation (such as hunting) resulting in some species reaching the brink of extinction. With free ranging herbivores disappearing from Europe’s natural landscapes and replaced by growing levels of livestock farming, areas changed both in appearance and natural dynamics and processes. However, the ongoing trend of land abandonment in many regions of Europe is growing interest to bring back free roaming and wild-living large herbivores to natural European landscapes. Leading this movement Rewilding Europe has already set up natural grazing pilots with large herbivores in different rewilding areas and is inspiring others to start similar initiatives. To promote natural grazing and share knowledge, experiences and good practices Rewilding Europe (Wouter Helmer) and ARK Nature (Frank Zaderink) organised a five-day course for local rewilding teams and members of the ERN. The intensive Natural Grazing course consisted of lectures, workshops, training sessions, field visits, demonstrations and Q&A sessions with experts. In the first part of the week the participants gained knowledge about the purpose of natural grazing, the effects of large grazers on landscapes and biodiversity, what happens in their absence, and how to identify the need for reintroduction. Visit to Taurus Foundation in Keent and practicing scoring of Tauros condition with Esther Linnartz. Ronald Goderie from the Taurus Foundation, Leo Linnartz and Liesbeth Bakker from ARK Nature spoke about the various species of large grazers in Europe, their role in nature, and social structures together with presenting the Tauros programme in more detail. A very important topic covered included how to select animals possessing characteristics that are key to survival in natural environments with public access. The workshop also covered practical topics such as preparation of sites and site sustainability, organising the catching and transport of different animals such as bison, cattle and horses, together with coping with all necessary logistics. There was also a demonstration on the effective use of a mobile corral. Wildlife veterinarian, Mark Hoyer, spoke about veterinary risks of species reintroduction for the species itself but also for local domestic and other wild animals in the reintroduction area. Furthermore, he elaborated on sedation practices and shared practical examples. Ester Linnartz from FREE Nature and Esther Rodriguez from Kraansvlak touched several important topics such as site and animal monitoring, risks of overgrazing and handling of radio collars. Rene Krawczynski and Bartosz Lysakowski from the Brandenburg University of Technology provided the scientific background on the ‘circle of life’, while Bart Beekers elaborated on its relation to natural grazing and its ecological benefits. Participant practicing the set-up of mobile corrals. — “All the lectures and all the field visit were fantastic and useful with a very good mixture of learning and practicing. The stories from rewilding areas are inspiring and I look forward to further sharing the experiences and to encourage each other” – said Jonathan Rauhut from Oder Delta rewilding area. The second part of the course focused on the set up of natural grazing projects, policy and nature based economies. Renée Meissner, from Herds & Homelands, talked about European policy towards natural grazing, relevant laws and regulation, and the ongoing initiative for ‘Status Wild’. Wouter Helmer, Rewilding Director at Rewilding Europe presented the European Wildlife Bank, explained its role and mechanism and how it helps partner organisations to set up natural grazing projects. He also spoke about rewilding as an engine for the local economy and the role natural grazing projects could play in this context such as prospects for “wild meat”, wildlife sales, and nature based tourism. The final part of the workshop touched on the topic of communications where Twan Teunissen from ARK Nature spoke about effective communications on natural grazing projects, how to reach a wider audience to gain support and how to communicate in a crises event. — “As a communication person this workshop helped me appreciate and better understand rewilding work my colleagues from the Rhodope rewilding area are doing and I learned how to better communicate this to a larger “rewilding” public” – said Nelly Naydenova, Communication officer from Rhodope Mountains rewilding area. Visit of the participants to Gelderse Poort with Wouter Helmer who spoke about how natural grazing boosts the local economy. One of the many sites visited by the participants included Gelderse Poort, an important landscape in the Dutch Rhine delta. It was here, surrounded by densely inhabited areas, where ARK started its natural grazing initiative more than 25 years ago. Wouter Helmer, ARK’s founder and one of Rewilding Europe’s cofounders described the very first steps of the initiative and told the story of how ARK managed to develop natural grazing in the area. Other sites visited were the Kempen~Broek, member of the ERN , a large-scale project focusing on rehabilitation of natural processes, and the Maashorst rewilding area located in the province of Brabant, where the participants observed existing grazers including bison, Tauros and Exmore ponies. The Grazing course shared practical tools for the participant’s future work and provided knowledge to further develop and improve the pilot projects they are working on. 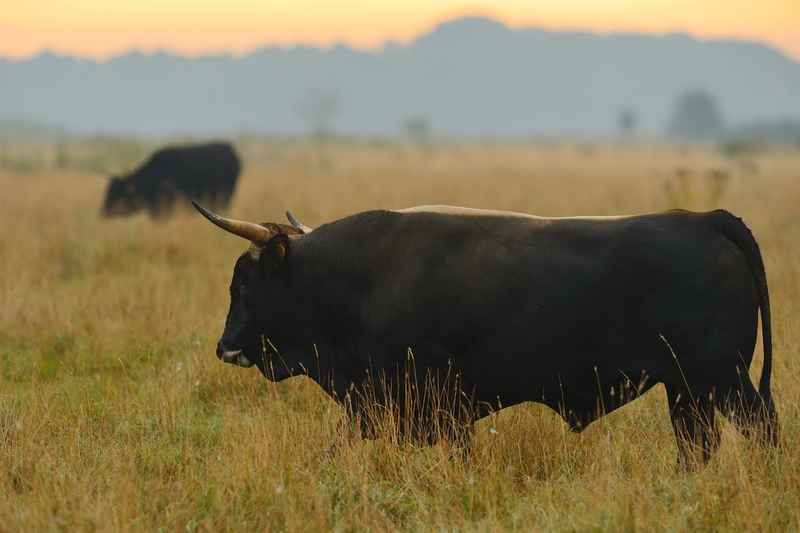 You can find out more about this topic in the Rewilding Europe manual on ‘Natural grazing – practices in the rewilding of cattle and horses’, published in 2015.